This title includes a Book, 1 DVD & 1 CD. 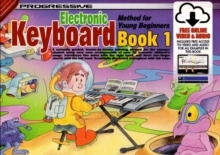 Learning to play the keyboard is fun with this carefully designed method for the young beginner. The key features include: easy to follow lesson-by-lesson format for the absolute beginner; incorporates a repertoire of well-known children's songs; introduces 5 notes with the right hand & 3 one-fingered chords with the left hand; teaches music theory in an interesting and practical way; full colour illustrations throughout the whole book; the student can continue on to "Keyboard Method for Young Beginners" Book 2 and Book 3; and a must-have for any child with an interest in playing a musical instrument. This method for Young Beginners also comes with a CD and DVD with recordings of all examples and exercises contained in the book.